Some people assume that when you go bald, that’s it for your head now. No need for anymore shampoo – I mean, you don’t have any hair right? No need to worry about dandruff or psoriasis – that’s only for people with long, flowing locks right? Well actually, you couldn’t be further from the truth. In fact, when you start to go bald you actually need to start taking care of your scalp and appearance in general more. If you’re going to rock the bald look well, you need to ensure you have a healthy scalp. Because your scalp is always on show, a good regime is a necessity. Before, you may have been able to use a random shampoo for your scalp. But now, you need to find something that works for you and your grooming needs. Heres my take on what the perfect bald head care regime is if you want to looking your best bald self. Lets run through these things individually to ensure that you’re getting the best regime for your bald head. Getting the best shampoo for your bald head isn’t easy – I tried a few different shampoos before I settled on the ones that suit me. I say one – I use two shampoos, and switch them out on alternative days. 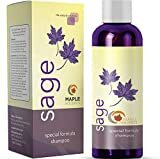 The first shampoo that I use on a regular basis is from Maple Holistics. It works extremely well for those who have a sensitive scalp. It’s completely free of all parabens and fragrances, which are a commonly known irritant for your skin. In reality, this shampoo isn’t necessarily made for people with bald heads. In fact, it’s advertised as being perfect for damaged colored hair and dandruff. Often shampoos made for dandruff are perfect for bald heads as they help to create a good environment for your scalp. Along with this shampoo, I also use Nizoral Shampoo. I don’t use it every day, but I’ll use my Nizoral shampoo once or twice a week. You simply apply it for 2-3 minutes and then wash it off. It’s scientifically proven to help with the health of your scalp, and I’d definitely recommend it if you have an oily scalp (which is a common problem for bald guys). Along with a good shampoo, you also need to find a razor that suits you. You’ve probably heard of the old safety razor vs cartridge razor debate, and it can be difficult to know which one is better. Personally, I prefer to use a cartridge razor on my head. This is primarily because they are far more forgiving on your scalp, and you can go against the grain without being concerned too much about irritation. Red rash is common for bald heads, so you need to find a razor that works for you. My favorite option right now is to use the Dorco Pace 6 – in fact, I only started to use the razor blades from them because I ordered them from the Dollar Shave Club. They’re made by the same company, so you don’t need to worry about them differing in quality. Overall, there are an abundance of different razors on the market for you to choose from and it’s important that you get one that suits you. You don’t necessarily need to use a razor – you can also find some electric shavers that work well and mean that you don’t run the risk of irritation. I used the Skull Shaver for many years and was always happy with it. Shaving cream is another important part of your arsenal as a bald man. The right shaving cream can leave your scalp feeling clean and refreshed. The wrong one will leave your scalp itchy and irritated. You don’t need to blow the bank on an expensive shaving cream – there are some good cheaper shaving creams that you can use that will work absolutely fine. The decision is really yours whether you decide to opt for a shaving cream, gel or even a shaving soap. Generally, most people use a shaving gel as this is the cheapest and most convenient. Though, it does definitely depend on your situation. Picking the correct method for you is crucial to your shave, and you should try a few different options to get the best one for you. A solid aftercare balm is another essential part of any head care regime. No matter how good you are at shaving, you’re going to experience some irritation at some point and it’s undoubtedly worth your time to pick up some aftercare balm. Finding a good post shave balm is essential to your bald head care plan. You might not need to use it after every shave, but you should definitely get some incase you experience irritation. If you occasionally shave against the grain by accident – we all do it – then a good post shave can stop any irritation that you’re experiencing. Overall, these are the necessary things that you must have to take care of your bald head. If you don’t have these 4 things, then your scalp might not maintain the same health that it would otherwise. You can pick up all of these things relatively cheaply, so there’s no need to break the bank for them. Nioxin vs Rogaine – Which works best? Win a Free $50 Amazon Giftcard! Please fill in this short Google survey for my friends University thesis – it will take two minutes and it’s completely anonymous (all emails will be destroyed after the giveaway). All you have to do is fill in this short 2 minute form. The winner will be picked at random in May and I’ll send you a free Amazon Giftcard worth $50 – this is a small giveaway so you might actually have a chance! Thanks! Step 1 – Complete the Survey! Step 2 – Enter Your Email!